In A Touch of Spice film-maker Tassos Boulmetis tells the complex and lyrical story of a sensitive boy Fanis Iakovidis (Markos Osse as young boy, Odysseas Papaspiliopoulos at 20, George Corraface at 40-ish), his grandfather Vassilis (Tassos Bandis) and life in their corner of the world, the ethnic Greek enclave of eastern Constantinople in the 1950s. 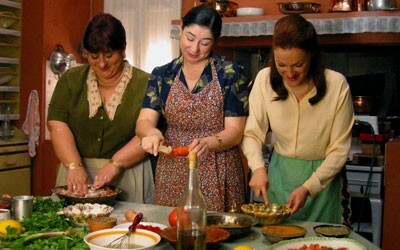 The original Greek title of the film Politiki Kouzina (roughly, "cuisine from Istanbul") serves as the overarching metaphor for the several narrative strands the film pursues. Grandpa Vassilis owns a small general store and is an expert on the uses of spices in cooking and in the art of persuasion in human affairs. As a boy Fanis displays a prodigious culinary talent, and raptly struggles to embrace every scrap of philosophy Grandpa Vassilis offers him. Over time, Fanis&#146; obsession with cooking becomes an embarrassment to his father, but a guide by which to steer his life. Fanis&#146; first infatuation, with Saime (Basak Kokl�kaya), a beautiful young Turkish girl, proves as deep and abiding a bond as the one between grandson and grandfather. The indestructible bond tying the Greek Iakovidis clan and their ethnic Greek and Turkish neighbors together is an abiding attachment to "The Polis" (Constantinople, later Istanbul), "the most beautiful city in the world." The strength of such powerful, yet invisible bonds, and how emotional attachments make up the spices of life, are explored and sorely tested as political events serve, time and again, to pull people apart. The regional political turmoil &#150; the deportation of Greek nationals from Turkey in 1959 (over political tensions in Cyprus), the xenophobic reception in Greece to the exiled Istanbul Greeks, the Greek military junta of 1964 and related ethnic strife between Greek and Turkish Cypriotes leading to the division of Cyprus 1964, all complicating personal responses to an uncertain world &#150; serve not as background history lessons but as central characters, whose ability to add spice to life is overpowering. Boulmetis tells his tale in flashbacks and extensive narrator voiceovers, concentrating on pivotal moments in Fanis&#146; life, which are offered up as a cooking course with instruction in "preparation," "main course," "dessert," and a denouement served up as "presentation." Grandpa teaches the basic spices using the planets as (conveniently symbolic) mnemonic devices. ("Pepper is hot and scorches like the sun," as the tag line for the film states.) Fanis acquires from his grandpa the habit of rubbing (sent and received) postcards in spices, associating a specific taste with a specific place, the film symbolically implying relationships between emotional and political life. When Fanis is deported to Athens, Saime gives him her toy baking kitchen, which becomes his most prized possession, tying the loves of his life (Saime and cooking) to his early life in Turkey and his later life in Greece. The excessively symbolic language of the film eventually overwhelms the narrative logic &#150; as Fanis grows up, he utterly forgets his youthful passions yet becomes a professor of astrophysics (because spices are like orbiting planets). The evocative period settings of urban ethnic neighborhoods and domestic interiors, the attention to historical details of clothing and customs, the gradual arrival of American consumer products create in the film a compelling sense of lived reality. As a counterweight to the heavy metaphorical spicing, the film also situates individual lives lived in precise contexts of unfolding political history. In doing so it offers glimpses into realities unknown, even largely unsuspected, by most American movie-goers. The look and feel, even the heavily suggested taste and smell, which A Taste of Spice evokes is both compelling and haunting. The nearest visual imagery from Hollywood carries echoes of Jewish and East European immigrant life in pre-World War II America. The severe and cruel interventions of larger ethnic and nationalist political realities also hearken to stories from the Nazi era. While the image and reality of a bitterly divided Berlin have recently faded into history, the stark fact of a deeply troubled and still very much divided Cyprus, and troubled relations between Greece and Turkey, remain. Too many cooks in the kitchen can spoil the broth. Fanis and his grandpa, Saime and her husband, and all the rest of the one-time enclave dwellers survive into the present day (or not), dislocated and relocated, trampled and tattered, yet still loving and still hoping. Only nowadays, everyone speaks English, sidestepping the tourists in Istanbul and Athens.